Living Archives project leader Susan Kozel gave a presentation at the Malmö City Library on the theme performing and sharing memories. In the presentation, Kozel emphasizes the need for viewing archives not so much as things as they are practices. This blog post is an edited transcript of Kozel’s presentation, available on Vimeo. SUSAN KOZEL: I’ll begin with a story. My background is in dance, philosophy and performing with new media, and my first visit to Sweden was in 2006 for a dance conference. At the conference, I met a French researcher, and she was an archivist. She felt that we dancers didn’t take archiving seriously enough. Our joke was that if ever I was doing a performance, and I thought that I wouldn’t be able to archive it, I would phone her and I would say “SOS archive!”, meaning I have an archive emergency. What I’m noticing now, seven years later, is an urgency around archiving which has become a huge topic politically, socially, in terms of the industry, and with regard to European Union policy, funding, heritage, etc. In the light of archive digitization, the questions are: how do we archive, how do we preserve the integrity of our archives, and how do we open our archives? Suddenly, an area that seemed a bit peripheral became very significant. When we talk about archives in Malmö, the first thing we come to think of might be Malmö stadsarkiv. We have the building, but we also have online resources. We’re shifting from the physical and material – files, rooms, and climate control – into the digital (see image below). Now I invite you into my archive: this is my storage area (see image below, left). I have a very loose system of finding things but I usually do find things. In looking for a box in particular, I thought “maybe what we have are archives within archives?” (see image below, right). In this project, we’re deciding to take seriously a number of current phenomena. One of them is the fact that we seem to be archiving ourselves, every day, and that social media are a huge part of it. Do we construct our own archives, or do we participate in other people’s archives? With Facebook, for instance, you are commenting and adding to other people’s archives. Is this old-fashioned photo album an archive? Or is this more of an archive? 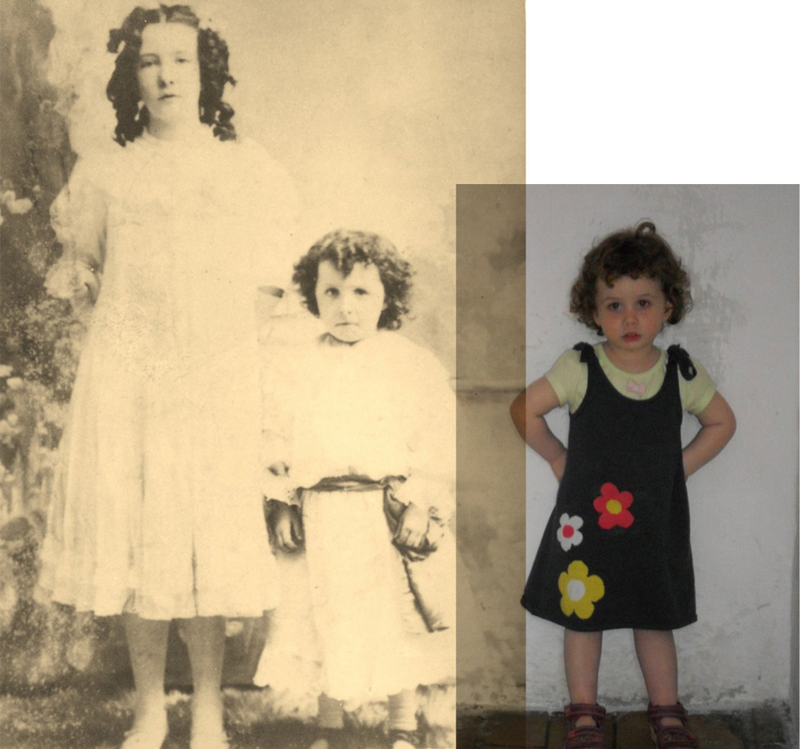 On the left is a photo of my grandmother with her oldest sister in Ireland in 1909, and to the right is my daughter from 2011. This photograph is of interest to our family, not just because we have very few photographs from the early 1900s, but because of the family resemblance. Do archives gain a different meaning when they engage with material that really is old, that feels old, that is beyond our living memory? To the left is a performance I did two years ago (IntuiTweet) with two Finnish dancers, Mia Keinänen and Leena Rouhiainen, and we decided to use Twitter as a way of moving through the city. 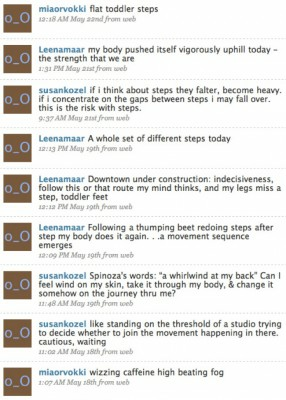 We would do a dance movement, maybe in a house or a park, and we would tweet what we just did. When we received it, the other people would dance it. It was a way of trying to get the body into social media. 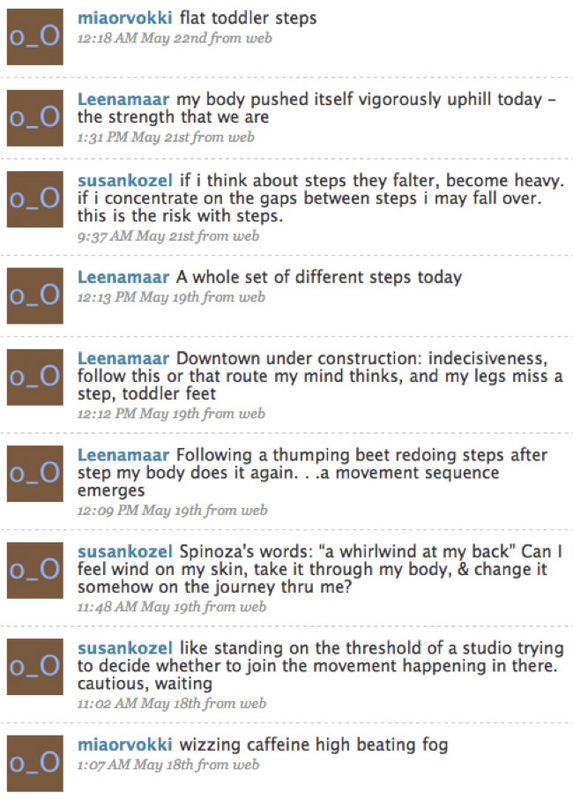 What we discovered, quite by accident (because we didn’t know Twitter that well), was that Twitter leaves traces. We had this script of movement, and we didn’t know what it really was (see image to the left). Was it a script? Was it a musical score? Was it an archive? There is a strong poetic element to archiving and, particularly in the 20th century, many artists have been dealing with archives, e.g., Christian Boltansky’s in his No Man’s Land in New York City from 2010 (see image gallery). Boltansky had a massive pile of used clothes that even smelled used. He also had many old biscuit tins. You could feel the traces of the people in the clothes. It was actually a very creepy exhibition and his work is often about collective memory, but also about genocide, life and death. The question would be: “is there some sense of archiving in the materials that we leave behind?”. You can also think of archiving as a practice. This is a knitting pattern book from the 1960s (see image to the right). Knitting and other craft practices are actually passed on from grandparents to their children and grandchildren. They way your body is taught to knit is very different in Britain from e.g. other countries in Europe. 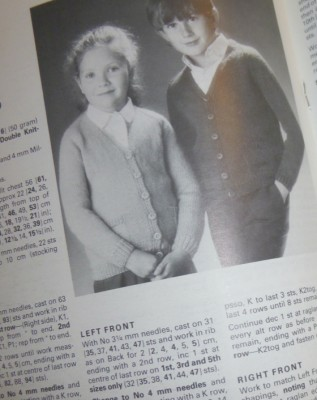 What I discovered with this knitting book is that codes are different: I couldn’t read the stitches. There was an even older one from the 1940s where I couldn’t understand the abbreviations, which is interesting when we think of codes as digital code. We think of archives not as things but as practices. How we archive is actually how we remember. The French philosopher Jacques Derrida said “How we archive is how we live”. 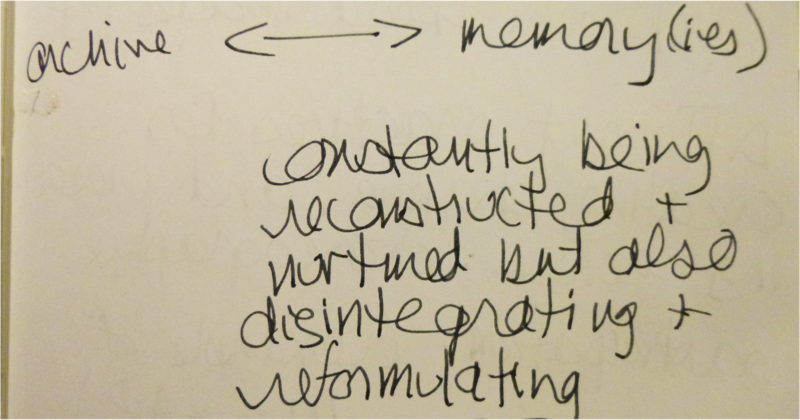 This leads us to one on the research strands of this project called Performing Memory. We are creating a line of questioning between archiving and memories: memories are constantly being reconstructed and nurtured, but they also disintegrate and are being reformulated. We are always losing things and then reconstructing them, forgetting them and piecing them back together. I would suggest this is a sort of archival performance. In other words, forgetting is essential to remembering. 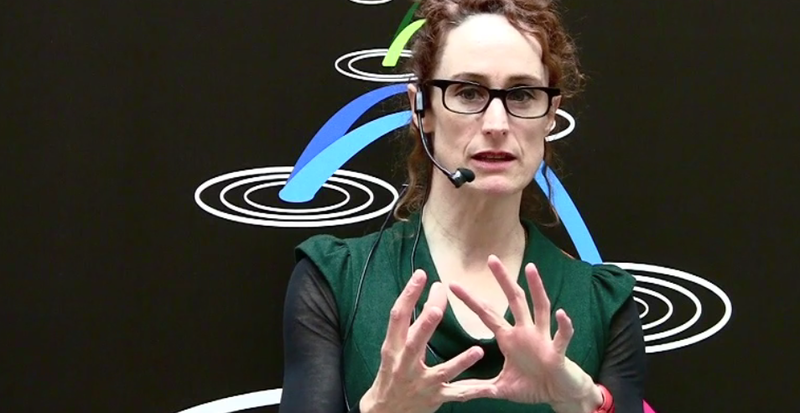 The French anthropologist Marc Augé has said “Oblivion is the life force of memory and remembrance is its product” (Marc Augé, 2004) (editor’s note: also see Anne Galloway’s Collective remembering and the importance of forgetting: a critical design challenge). If we don’t perform our memories, which means to select, codify, and prioritize them, then we simply drown in them. We have to be able to put things in the background and concentrate on the foreground. The same things goes for our memories: if we’re not constantly losing things a little bit, then we haven’t actually got attention to let the new ones join us. The second major research strand of this project is Open Data. Ryoji Ikeda is the Japanese artist behind Datamatics 2.0 (see image gallery) and he always does these big, sensory installations that come from data flows, through the Internet or generated from mathematical algorithms. He immerses people in, often, black-and-white imagery, like pixels. The movement in these images is constantly changed by whatever data source he is tapping into. There is a lot of open data out there, whether it’s civic data or scientific data – but if the data is just a massive surge of statistics, how is it meaningful? One of the things we would like to do is to look at the levels when data is initially codified, when either specialists, or computer scientists, begin to create structures around this massive flow of data, so that we can start making meaning of it. We are trying to find our own way of linking open data, archiving and memory. What this does is to emphasize that archives are social. They are not just something that has a strong line drawn around it and exists in disconnection; archives are embedded in social relations. This brings up questions of participation and inclusion: How do we participate in public archives? How can they be inclusive? Over the next few years, we will be conducting a series of workshops, because we don’t assume that we know the answer to all these questions in advance. We might be finding out from you what you do to archives, and what you would like to do to open up the material to others or not. In February, we did the first of these workshops with Skånes Dansteater. Part of our methodological basis is to work with participatory design approaches and we had two weeks of working with Skånes Dansteater’s outreach programme. The first week had four dancers using wheelchairs from the Aktiva tjejer group in Malmö, and Daniel Spikol’s masters students from the Media Software Design programme at Malmö University, plus a few of our Interaction Design masters students, and the video artist Jeannette Ginslov. We brought several interesting pieces of technology into the dance studio. What we did was to experiment with Augmented Reality, because one of the things we’re interested in is whether archiving can be made mobile and located in the city. In the workshop video above, the dancers are living in what could be called augmented reality space. In it, media has been dropped onto the device through an augmented reality browser. You can see the camera bringing the “real” space in underneath the dancers. This is a potentially interesting set of technologies – there are several augmented reality platforms – because you can bring visual material into it. It can be old maps or photographs, or video footage. Then you have a way of letting the contemporary world filter through. The first video was an experiment in the studio. The second video (embedded above) is from the experiment carried out in the STPLN skateboarding park. What is going on here is that you have audience members holding iPhones and iPads, and you have dancers holding a card. What the number on the card does is that it tells the iPad/iPhone which video to show. But, we’ve added an extra movement dimension so that both the audience members and the dancers have to move to see the visual material. I would want to suggest that participation is a dance of receiving and giving. With archive material, we can receive the material into our mobile phones or into our memories, and then we can also give our reactions and our responses. One of the partners in this project is the Malmö film company Auto Images. They wanted to document the visual history of Malmö, but they realized they didn’t have much “official” footage, so they spread the word to people that they were interested in old footage, and the response was huge. People in Malmö gave them so much material that they have boxes of it. They have produced a series of DVDs, and we are very interested in working with them to see how we can possibly use their material in some of our research experiments. We haven’t yet decided how to work with them or how to use the material. There are several starting points to see how we can actually use old footage, combine it with new footage, and experiment with how the material can be used to emphasize movement in the contemporary Malmö in relation to the old Malmö. Tagged DansAR workshop series, open data, performing memory.